These fish are exhibits in Seoul Coex Aquarium. The name of these fish is red belly piranha. There is red tone at the belly of them. That is the reason they are named as red belly piranha. Red belly piranha is a species of piranha which is originated from Parana River, Amazon River, Orinoco River and Essequibo River in South America. When it comes to piranha, the first thing that comes to mind is the aggressive nature characteristic of the fish. It has a set of blade sharp teeth which are able of tearing flesh from its prey. 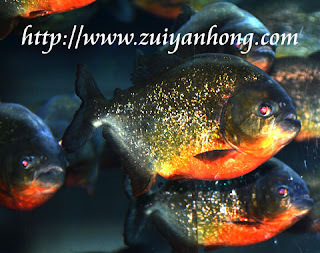 In case you are interested in keeping red belly piranha, these are a few suggestions which you should take note. The aquarium should measure at least 92 x 48 x 48 cm. The temperature of the water should be between 23°C - 27°C. It is advisable to put some bogwood in the aquarium to maintain the pH. You can feed red belly pirahna with dried pellet food. Live fish and shrimp is another choice for feeding red belly piranha. Red belly piranha also eats frozen food such as fish, prawn, cockle and mussel. The young one of red belly piranha is quite timid. It is better to keep the fish at least four in a group. Thanks for your message. I have to say sorry on adding your link because I have stop exchanging links.